The most recent creative team on Runaways has officially secured itself as restoring the title back to its roots. Writer Kathryn Immonen (Patsy Walker: Hellcat, the webcomic Moving Pictures) has obviously studied the series in terms of both style and voice, crafting one of higher quality and familiarity. Artist Sara Pichelli also has a style which is both expressive and animated while being able to take on the more serious and dramatic aspects of the comic book. Runaways, after a fairly mediocre run by Terry Moore, coupled with terrible art, and another average at best run by Joss Whedon, plagued by delays, is finally back on track, being both serious and a lot of fun to read. 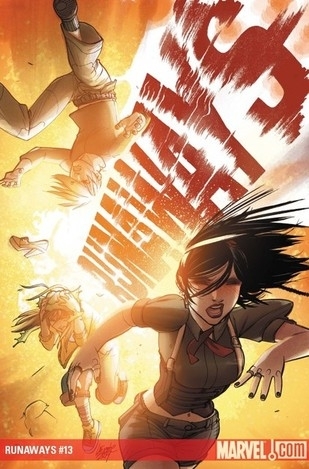 The first panel of the book has Runaways leader Nico saying “You can’t run away from this,” referring to the fact the group is trapped in a house by plants. I hated the line, it was cheesy and weak. But then, Chase interjects, calling Nico on this bad line and the story continues. Immonen purposefully took a fairly awful piece of dialogue and used it to comment on the story as well as make the opening of this issue great. And the story remains consistently great throughout. Immonen mimics the style of original writer Brian K. Vaughan while nailing characterization and a general feel for the book. This issue in particular has some stand out moments for a lot of the cast. Notably early on, Chase and Nico share a kiss which is not for anyone’s benefit. After it happens, they both state it didn’t make them feel any better but they do it again anyway. The team is exhausted and indifferent, and Immonen uses this scene to emphasize the fact they are still teenagers who, despite all their efforts, are being forced to grow up too fast. In the same scene, Immonen finally reveals a secret placed very early on in the series, the mystery surrounding the murder Chase apparently committed. But I’m not convinced this is the real story, if there even is one. Nico points out Chase has “told a couple of versions of that story” and I am not entirely convinced this is the real one. There are holes in this telling as well. Even if it is true, we are still not being told everything. A lot happens in this issue, but it seems Immonen is trying to get the title back to where it started (a major hint would be the last line of the issue! ), and this is a very good thing. Artist Sara Pichelli has the exact style for this book and the tone Kathryn Immonen is going for. While this issue specifically is a very serious one, lacking much of the humour the series is known for, Pichelli is certainly more than capable of handling a serious issue. The characters express emotion very well while being immediately recognizable. The action sequences, the few there are in this issue, are also handled very well. But the fact the issue mostly deals with a lot of talking and Pichelli manages to stay away from the entire comic book looking like heads talking shows her ability to keep the reader engaged. The story is very dialogue heavy and Pichelli keeps things interesting with her use of different angles, lighting, and shot lengths. 8/10 A dense story that is still very good while the art is able to keep things interesting.